There’s great temptation for beginning travel writers to boost their number of published travel stories by planting numerous articles on travel websites. On the surface, this seems very impressive. It’s a great way to collect a lot of bylines quickly. But over time, this practice doesn’t pay off if you want to move up into print media. If a beginner keeps pitching online, that’s exactly where they’ll stay. Their portfolio seems hollow. And since the majority (or all) of their articles are online, they essentially worked for free. 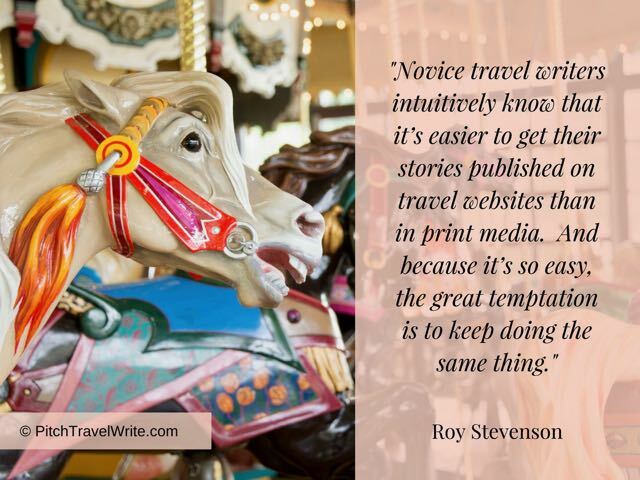 Novice writers intuitively know it’s easier to get their stories published on travel websites than in print media. And because it’s so easy, the great temptation is to keep doing the same thing. But they’re missing a key point. Travel website editors will generally take anything you throw their way. They’re not picky about the writing standard of the articles because they don’t pay. (Sure, a few travel websites do pay, but it’s generally a token amount—often as little as $25/article). Even when the writer is paid by the website, it comes out at a few cents/hour. Not good business for the writer, and it’s certainly not going to pay the bills. Travel writers that continue to feed the insatiable online beast are only helping travel website owners make money by providing free—or almost free—copy. Even worse, many travel writers continue to write for the same travel website, when they should be spreading their stories around a dozen or so travel websites. If a magazine editor searches online for “your name + travel writer”, it’ll look more impressive if you have one byline in each of 12 travel websites, than 12 bylines in one travel website! The danger of putting all your work on one website is this: you have no control over what happens. The website can go out of business. The number of travel websites and blogs that fold every day is staggering. Large numbers of site owners simply walk away because they’re far more work than they anticipated, or their owners simply lose interest. Perhaps the most dramatic example of a popular website folding is the recent demise of Examiner.com. I know several writers who had their entire life’s work on examiner.com. They were devastated when it closed down, and they lost several years of work because they no longer had an online portfolio for show and tell. Are You Working Toward Long-Term Travel Writing Goals? Travel writing is huge in the digital world. But the king is still print media. Even travel bloggers and travel website editors grudgingly admit that print media is still the gold standard. I would caution you that in the long run, the strategy of having most, or all of your work published online will not advance your travel writing career. All you’re going to have in five years’ time is a bunch of poorly edited stories on the Internet, for which you were not paid. That gets old very fast and will leave you with no real feeling of accomplishment. Should You Pitch Print Magazines and Websites Simultaneously? If you pitch your story ideas to print magazines and websites simultaneously, the results are predictable. The website editors will be the first to go for your story. They’ll snap them up! They’re always looking for free copy. I’ve seen this pattern dozens of times with the writers that I coach. I recommend that my writers always pitch to their print media list first. Even beginners can, and often do, sell their stories to print magazines. If, after several weeks, no print magazine editors are interested in your story, you can switch to “Plan B” and pitch your story to travel websites. What About Using Your Travel Assignments for Comps? I’ve certainly used plenty of online stories as collateral for complimentary travel. And I haven’t been bashful about this! At last count, I’ve racked up around 100 articles online from a total of 1,000 published stories. But print media has published 90% of my work, including regional, national, and international magazines, specialty magazines, custom publications, newspapers, trade journals, and in-flights and on-boards. You may have been smart enough to parlay your online travel stories into complimentary travel. You may have scored some or all of the following: free hotel or resort stays, free transportation, free entry to tourist attractions, free guides, free tours, free meals. But there’s still one problem. You’re not getting paid for your time. I always round up several print assignments for each destination, so that I still emerge from my trips with some hard cash in my pocket for my efforts. My guideline is to earn an average of $200/day from my print assignments when I’m traveling. While I may fall short of this financial goal occasionally, my minimum objective has been to at least cover my basic daily accommodation, meals, and transport costs. For example, I did a six-week travel writing stint in Europe in 2013. I emerged with a reasonable profit after I deducted all my out-of-pocket expenses. On this tour I produced twenty-three paid articles for eleven different magazines and websites. By focusing first on writing for print media, I’ve certainly made a lot more money than my digital counterparts who only score complimentary perks. Most Destination Marketing Organizations (DMOs) still prefer assignments from reputable print media (usually defined as having a total readership of more than 100,000). Recently I’ve noticed that DMOs are requiring online assignments with travel websites or blogs that receive more than 1,000,000 readers! If you want DMOs to take you seriously and work with you on comps, print assignments are worth their weight in gold. When requesting complimentary travel perks, you’re more likely to get their cooperation. Print magazine editors also prefer print media when looking at the portfolio of writers under consideration. Editors will check you out online to see how you write. That’s a good standard business practice. It's important that your online stories are well-written. If they’re not well written, you’re hampering your chances of ever breaking into print media. In the end, a whole bunch of online bylines - with an absence of print bylines – won’t impress print magazine editors. Print magazine editors know that anyone can get their articles published online. There’s no screening process for website articles. You need to pass the initial screening with a solid story idea and a strong query letter. Your article must be publishable (well-written). Now you know why so many writers opt for the travel website route. Getting your stories into print is hard work, at least initially. Only good writers get their work into paying print publications. Many aspiring writers take expensive travel writing classes and workshops. Then after the workshop they only get their stories published online. Since most travel websites don’t pay, they never recoup their workshop fees. This seems like a huge waste of money, considering that for less than $8 you could buy my reference book, 50 Websites That Want to Publish Your Travel Stories. With this book alone novice travel writers could launch their online travel writing career and save hundreds of dollars! When Should You Write for Travel Websites? As leverage for requesting complimentary travel perks. Increasing your online presence (on several travel websites) when you’re just starting out. Developing your travel writing skills. These are four reasons to get published online. But you probably won’t get paid. Use online travel websites in moderation, and to establish a basic online presence and then move on to print. Remember that print media usually pays. You’ll still qualify for those comps. You’ll have far more credibility as a real travel writer. More doors will open for you when you become established in print media, and your travel writing career will be far more satisfying.